Where are the best opportunities for outdoor kitchens? New opportunities for growth will be available for suppliers of grills and related items since it is a relatively undeveloped market. Consumers will enjoy high-end add-ons and upgrades will benefit from outdoor kitchens aimed to impress. More impressive displays that allow for personal touch will be embraced by consumers. Specialty-type grills like kamados will also offer areas for growth. What does the future of outdoor kitchens look like? Mass-market products will broaden the consumer base over the next five years. 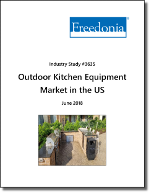 Companies operating in related markets – such as the larger outdoor living market - – can extend their capabilities and brand reputation to compete in the growing market for outdoor kitchen equipment. What are the key trends we will see in the outdoor kitchen equipment market?